Sand dunes, a shipwreck and, if the evening is clear, a sunset over Lake Michigan; Green Point Nature Preserve is one of Grand Traverse Regional Land Conservancy’s most impressive efforts. Acquired in 2005, the 242-acre preserve is south of Elberta in Benzie County and contains nearly 3 miles of trails that wind through stands of brilliant white birch, beech-maple forest that is carpeted in the spring with wildflowers and open meadows. But it is the more than 2,100 feet of Lake Michigan shoreline and the high bluff bordering much of it that makes Green Point Dunes so spectacular. The vistas are the result of a glacial moraine extending east to west and separating the Herring Lakes watershed to the south from the Betsie River watershed to the north. 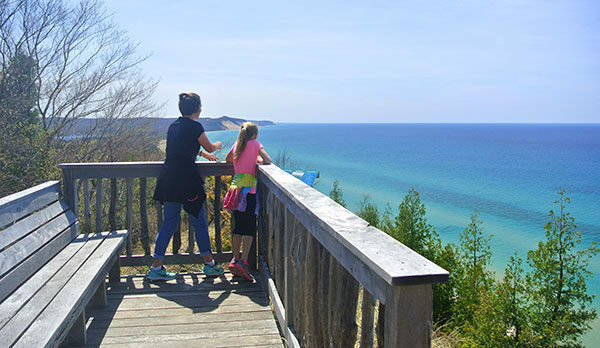 From Lake Michigan the steep ridge rises 274 feet, more than enough elevation for dramatic views of distant shorelines in each direction. Almost half of the preserve has also been labeled by the state as “critical dune,” a designation to protect fragile dune areas. At Green Point, the dune habitat includes wide sandy beaches, open foredunes that are home to the state and federally threatened Pitcher’s Thistle and forested dunes. The trail system at Green Point Dunes forms a 2-mile loop to the beach and includes all three viewing decks and access to the Lake Michigan where the curious can explore the City of Boston, a 19th century shipwreck just offshore. Departing from a second trailhead along Green Point Road is a two-track that crosses the preserve to private property south of it. The two-track, occasionally referred to as the Inland Trail, is closed to vehicles, but hikers can use it to reduce this trek to 1.5 miles while still reaching the observation decks and beach. From the parking area on Green Point Road, The trail crosses a small meadow and then begins a steady climb of a forested ridge. You top off in a quarter mile and if it’s early spring or late fall can see a sliver of Lake Michigan blue through the trees, teasing you of what lies ahead. The trail descends through the rolling terrain and at Mile 0.3 reaches post No. 1 at the junction of the return trail. The descent continues to post No. 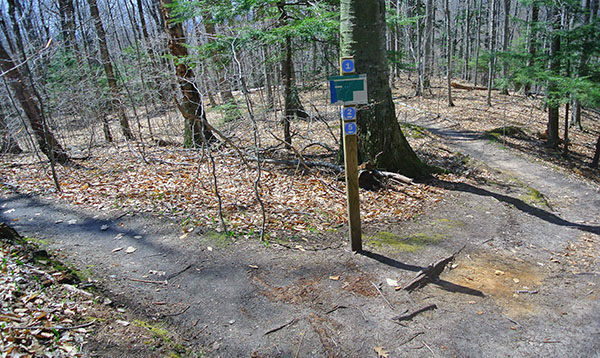 2, marking the two-track or Inland Trail, then the climbing begins. You pass an inviting log bench on the way up and then at Mile 0.6 reach post No. 3 and the first deck. The view includes the large open meadow that occupies the middle of the preserve and Lake Michigan shoreline and Lower Herring Lake beyond it. After another dip and climb you arrive at the short spur that leads to second deck. 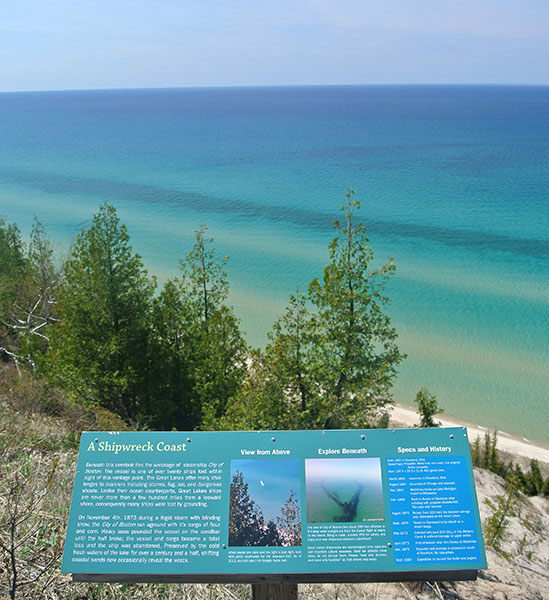 To the south is a much better view of the shoreline, Lower Herring Lake and Baldy, the towering open dunes that is part of Arcadia Dunes: the C.S. Mott Nature Preserve. To the north the shoreline leads to the Frankfort Lighthouse. And below is the City of Boston that ran aground in 1873. Outline of the streamer’s bow is just to the south of the observation platform clearly visible when Lake Michigan is calm. The main trail continues south along the edge of the glacial ridge for a spell before descending rapidly to post No. 4, reached at Mile 1 and marking the another platform and the massive stairway to the beach. Depending on the water level, the beach is wide and beautiful. Those who pack in a bathing suit, mask and a snorkel can spend an afternoon exploring the shipwreck. Built and launched in Cleveland in 1863, the City of Boston was a 136-foot-long wooden steamer with an engine and propeller but also a mast and a history of bad luck. In 1868 the City of Boston collided with another steamer and sank in the Straits of Mackinac. When the steamship was raised 125 feet two years later it was the deepest salvage ever attempted in the Great Lakes at the time. After returning to service as a stream barge, the vessel took its final voyage on Nov. 4, 1873. During a frigid storm with blinding snow, the City of Boston ran aground on a sand bar just off Green Point Dunes. The raging surf quickly broke the hull and the ship was abandoned by its crew. 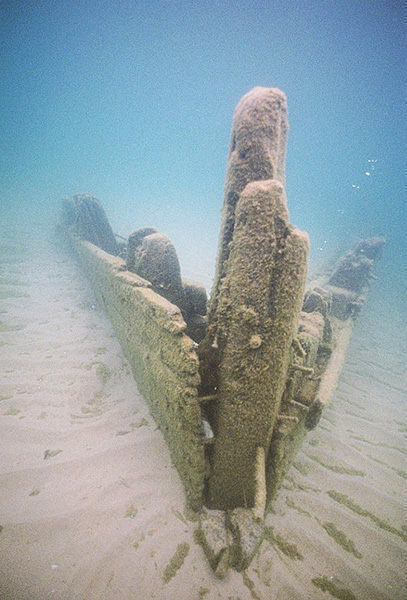 Its boiler and engine were recovered in 1887, but the rest of the vessel is now one of the most popular shipwrecks along Lake Michigan. What remains of the steamship is located due west from the lowest flight of the beach access stairway, 150 to 200 feet from shore depending on the water levels. It’s angled in 7 to 8 feet of water with its stern buried in the sand bar and its bow occasionally less 4 feet below the surface of the lake. For more on the City of Boston shipwreck go to the Michigan Shipwreck Research Association web site. From the beach access stairway, the two-track and post No. 5 is reached within a few hundred yards and is followed by a steady uphill march to the top of the glacial moraine, a climb of 232 feet. You top off near post No. 1 at Mile 1.7 and from there backtrack the first leg of the hike to the trailhead. At the main trailhead, there is parking for a dozen cars and an information kiosk but no source of drinking water. Green Point Nature Preserve is open year round and attracts snowshoers in the winter. There are no entry or vehicles to visit the preserve. From Frankfort head south on M-22 and in 4.3 miles turn west (right) on Green Point Road. In less than a quarter mile the main trailhead will be on the south side of the road. In another quarter mile is the trailhead for the two-track. For more information contact the Grand Traverse Regional Land Conservancy at (231) 929-7911.